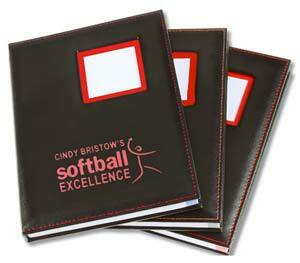 This Softball Excellence Journal is designed to help that special softball-someone in your life. Whether a coach taking notes at a clinic or after practice, or a player practicing and playing their way through college, club or school ball, this journal will be a great tool! This faux leather bound journal includes softball red stitching on the cover, comes stamped with the Softball Excellence logo, and includes 100 lined pages ready to be filled with softball notes and secrets! Keep a visual reminder of your softball goals with the 2" x 2" photo frame that’s built into the cover of this notebook. Stitching on the cover, lines on the paper and paper borders all match the softball red frame color for a coordinated look. TEAM BUNDLES - 40% Savings! A player printable PDF sheet of journal swag to help decorate and personalize your journal. Just print this page out on 8.5" x 11" full sheet label and cut and stick the ones you like into your journal to customize. A coach printable PDF sheet of journal swag to help decorate and personalize your journal. Just print this page out on 8.5" x 11" full sheet label and cute and stick the ones you like into your journal to customize. 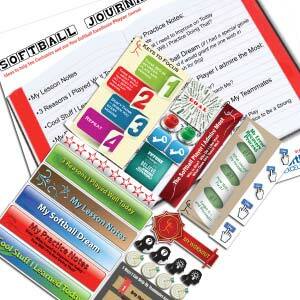 The Player and Coach Journal downloads are 2 special PDF’s to help you customize your journal. Print out these PDF’s and let them help you learn more about softball, about yourself, about your team and about how to improve!